This post is published on behalf of the Syniverse Luxembourg office’s Employee Association. 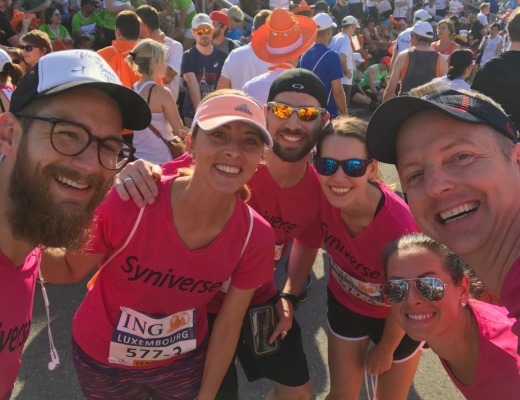 Each year ING and the city of Luxembourg host the ING Luxembourg Night Marathon, and this year, as we have done in several past years, the Employee Association of the Syniverse Luxembourg office organized a team to take part. On May 27, we had over 20 runners register to run for the charity Médecins du Monde and join over 15,000 other runners who participated in the race through the streets of Luxembourg City. Showing off our team colors in front of our office before the race, with me in the center. Go, Team Syniverse! What organization(s) did the activity support? We decided this year to donate to the Luxembourg chapter of Médecins du Monde, or Doctors of the world, an international organization that provides emergency and long-term medical care to vulnerable people and now has over 400 projects in more than 80 countries. To spark even more excitement for our fundraising for the run, we set up each runner with a personal donation web page on which individual donations could be made for that runner. We asked each runner to promote their page and have colleagues, friends and family members sponsor them. We awarded the top fundraisers special prizes, and our biggest fundraiser drew more than €400 (approximately $474) in donations. The personal pages were a big success and helped us exceed our team goal of €2,000 (approximately $2,370) and collect a total of over €2,700 (approximately $3,200). A quick snap before the race. We had 21 runners register this year, including three full marathon runners, six half-marathon runners, and 12 team runners. It was fantastic participation by our 100-person office. 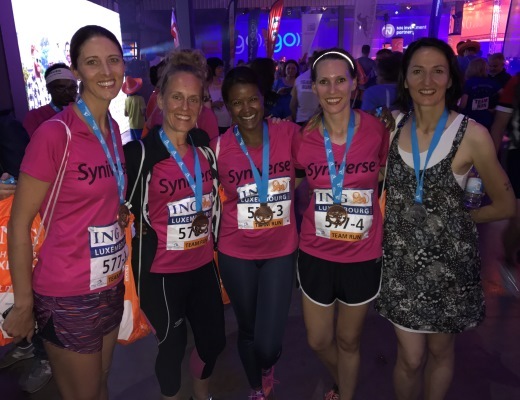 The most rewarding part of the experience for me was the training that many of our team members participated in the months before the run. We all helped each other physically prepare to run these long distances, and at the same time got to socially know each other a lot better. And, of course, raising €2,700-plus for a worthy cause was also rewarding in itself. We look forward to building on this success in future runs and events! With medals in hand, we celebrate a job well done! Danielle Palmyre is Facilities Coordinator at Syniverse's Luxembourg office.